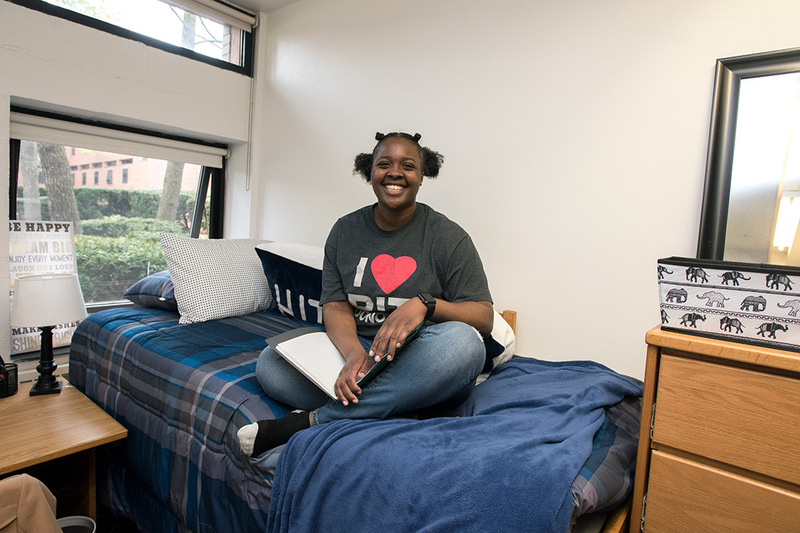 Shantinique Cowans was a recipient of the M. Forrest and Robert Hurlbut Residence College Fund, which allowed her to live on campus. Shantinique Cowans ’18 (media arts and technology) enrolled at RIT instead of at other colleges because she was offered a full-tuition scholarship through the Destler/Johnson Rochester City Scholars Program. The scholarship, though, didn’t cover housing expenses, so she took out a loan her first year on campus. The second year, she became a resident adviser to help cover room and board expenses. “I was hoping to continue as an RA but I started having health issues, which created financial issues,” Cowans said. She was diagnosed with lupus and was in and out of the hospital. She finished her year as an RA but Cowans said there was no way she could take the job again because of her health. She reached out to the Multicultural Center for Academic Success and learned about a scholarship that helps students with housing expenses. The M. Forrest and Robert Hurlbut Residence College Fund was established in 2012 to provide on-campus room and board support to students in the Rochester City Scholars Program, said Robert Hurlbut ’84 (hospitality), who named the scholarship after his sons. It was huge for Cowans, who said commuting wasn’t an option because she is the oldest of eight children and focusing on school work at home would have been difficult. The fund was the first at RIT designated solely for housing. Hurlbut, president of Hurlbut Care Communities, said he hopes it inspires others. RIT publicly launched a $1 billion campaign in July. Cowans is one example of how students are already benefiting from Transforming RIT: The Campaign for Greatness. To learn more, go to rit.edu/transformingrit.